Season the ground lamb liberally with kosher salt and freshly ground black pepper. Using your hands, mix in the garlic, dill, and mint. Divide meat into 4-6 portions, shaping into a disk, approximately 4 inches in diameter. Brush the patties with grapeseed oil. Place a cast iron pan or grill pan over high heat for 2 minutes. Once the pan is preheated, carefully lay a patty into the pan. Once the underside is a deep golden brown, about 2 minutes, flip the burger. Cook until the other side is browned and cooked to the internal temperature of 160 degrees F, 1-2 minutes more. 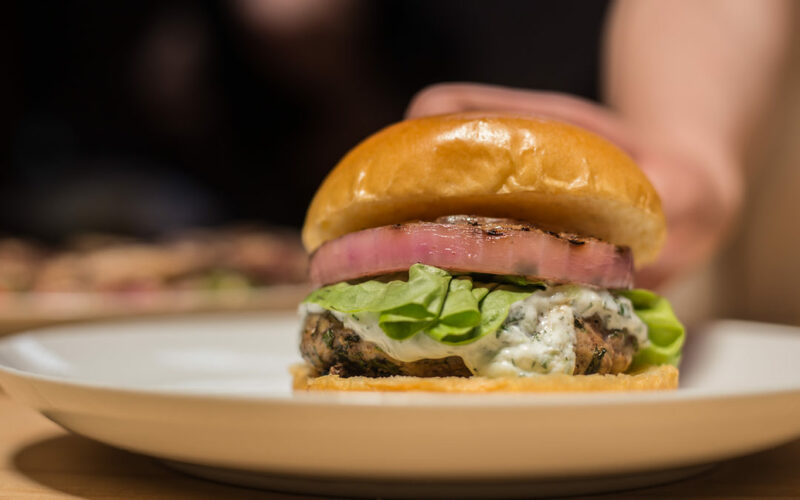 Transfer to a plate, then repeat with remaining patties. 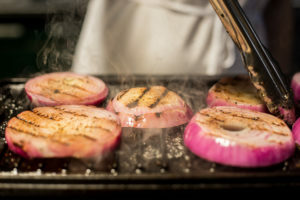 While the burger patties are resting, use the same pan to griddle the red onions. Using the remaining oil in the pan, add in the red onion disks. Season with kosher salt, and allow to sear on high heat until the onion begins to soften and develop a deep caramelized exterior. Flip the onions disks carefully (so they stay intact), and repeat on the remaining side. The interior of the onions should still have a bit of crunch. Using the same skillet, add a small amount of butter, and reduce the heat to medium. Add the cut brioche buns to the pun, cut side down, allowing the butter and remaining pan juices to soak into the bread. Cook until golden brown and warmed through, about 2 minutes. 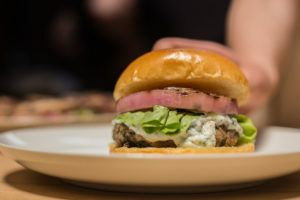 Build the slider: add a small amount of tzatziki to the bottom bun, followed by the lettuce, burger patty, grilled onion rings, and finally a another spoonful of tzatziki and the top bun.